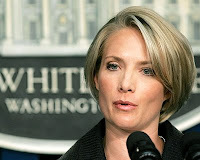 AAEA Hollywood: Is Dana Perino Really Kella Ripa With a Wig? Kelly Ripa pulls off her wig each morning and shuttles from the "Live With Regis & Kelly" show in New York to Washington, D.C. to transform into White House Press Secretary Dana Perino. It is amazing what they can do with makeup these days. But not much needs to be done with these two, er one. They could easily be twin sisters. Yet if you look closely, you can see that Kelly is really Dana. Regis Philbin brilliantly pulled this off without anyone noticing except AAEA-Hollywood. Those who know us know we are always on the cutting edge of research. This 'find' is one of our biggest coups. Why hasn't anyone else noticed this? All of Hollywood and the New York elites missed it. Now the paparazzi will be stalking the show to try to catch Dana in her mad dash back to DC. Yet Dana will be leaving the White House soon so maybe 'Reeg' will finally spill the beans. Now don't go thinking that 'Reeg' is really George Bush.